When the sun goes to sleep, the moon comes out to play. That's the way it works, right? Keyfra kept an eye on the sky while walking her dog and noticed something strange—the moon was awake...during the day! But how can this be? The sun was obviously wide awake, which meant that the moon should of been sleeping and safely tucked underneath the horizon's comfortable comforter....right? The moon is a very sophisticated rock orbiting a much LARGER very sophisticated rock. A lunation takes about 29 days…so…what does that mean? That means the moon travels a specific path across the sky (near the ecliptic) and will sometimes be further or closer to the sun (in the sky). There are a handful of distinct lunar phases and they’re all caused by the geometry of the Earth, moon, and sun. Is it true that the moon can only be seen at night? Absolutely not—Keyfra proved it. 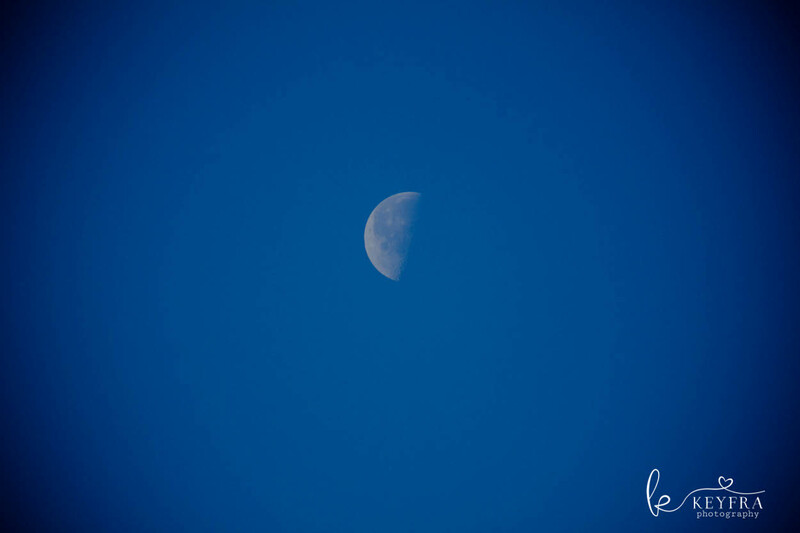 The moon can actually be seen during the day, morning, noon, dusk, night…whenever! It doesn’t matter if the sun is “awake”. Or sleeping. Or watching television. Or playing foosball. The moon orbits to the beat of its own drum. Well…not quite. But kind of. You get what I mean. I hope. Three factors typically prevent an individual from seeing a day moon. The sun’s glare can make it very difficult to see the moon. Directly staring at the sun is not a smart idea, especially with optics. If the moon happens to be less than day old, then its close proximity to the sun will easily persuade you from not even trying to look for it, or you simply won’t notice the moon, because how often do you stare directly at the sun? Exactly. Elevation can also prevent you from seeing the moon at a particular time during the day. If the entire planet is in your way, or perhaps a lovely mountain, then you’re going to have to wait until the moon rises above your specific location. Someone loitering near sea level would see the moon relatively earlier in the day. Lucky them. Depending on the specific lunar phase (or season), it may take too long for the Earth to rotate the moon into view. The length of a day is impacted by the seasons, which means there may not be much daylight available (depending on the location). In New England, for example, the sun set can set as early as 4:40 pm. If the moon decided to rise above the horizon around 5:00 pm…guess what? It would already be dark. Wait for a lunar waxing gibbous phase: The moon will be substantially away from the sun and you’ll most likely notice or see this particular phase—because of happenstance—or intentionally. Research specific location: If you can’t locate a waxing gibbous moon, then research when the moon will rise above your horizon. Environmental Clutter: Trees and other objects can easily obscure the moon. Watch out. Thanks for sharing your observation, Keyfra! Keep your eye on the sky! Yea, well done ‘spotting’ it…of course we are aware that, thanks the powers that be…it is always there in it full glory..I wanne go there and have a peep back to earth, must be an awesome sight. The photo came out nice — Keyfra done a great job!